Malcolm Hoenlein - who flew in straight from J'lem - among US Jewish officials to meet with Erdogan to discuss reconciliation with Israel. 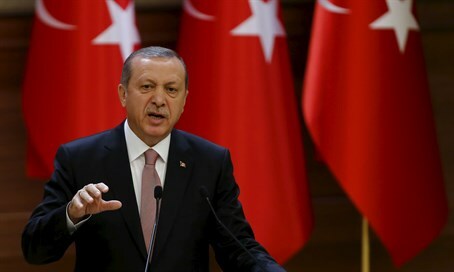 As part of ongoing negotiations for a rapprochement with Israel, Channel 2 reports, Turkey's president and prime minister met Tuesday with several senior representatives of the American Jewish community. The meeting with Prime Minister Ahmet Davutoglu and President Recep Tayyip Erdogan was held at the Cankaya Palace in Ankara. According to Turkish media reports, those present included the leaders of such organizations as the Conference of Presidents of Major American Jewish Organizations the Anti-Defamation League (ADL) and the American Israel Public Affairs Committee (AIPAC). Malcolm Hoenlein, the Conference's Vice Chairman, arrived at the gathering in the Turkish capital directly from Jerusalem. He is considered a close associate of Israeli Prime Minister Binyamin Netanyahu. A meeting of this kind has not been held in seven years - since ties between the Jewish state and Turkey first began to sour following Israel's Operation Cast Lead in Gaza. At an economic conference in Davos, Switzerland in January 2009, then-prime minister Erdogan stalked off stage after attacking former Israeli president Shimon Peres for the war. One possible reason for Turkey's change in tune may be the possibility of importing recently discovered gas from the Jewish state. In affidavits submitted by Netanyahu to the Supreme Court Monday over the controversial gas outline, Netanyahu stressed that talks were underway to export gas to Turkey. "The State of Israel has constantly maintained political dialogue with the governments of Turkey and Egypt with the goal of exporting gas to them, and through them to other countries," he said.